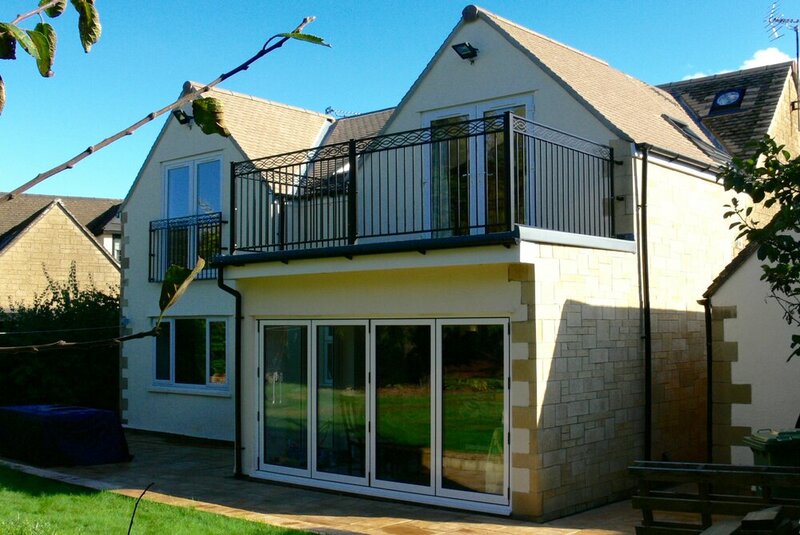 Welcome to Robin Designs Ltd. An architectural design service specialising in high quality house extensions in and around Bristol. Robin Designs Ltd is an established Architectural Design practice built on years experience with the simple aim of turning your ideas and wishes into reality. Whether you have an ambitious new build, your home is beginning to feel cramped or you simply want to unlock potential in your home, we look forward to helping you make your home a better place. As a Chartered Institute of Architectural Technologist registered practice and a Bristol City Council accredited agent Robin Designs Ltd has a reputation for providing a professional and friendly service with a focus on listening and understanding clients needs, in this way providing unique and high quality design solutions. This design features a cantilevered entrance which not only looks stunning, but also provides the wheelchair occupant to get out of his car and into the house without getting wet. This extension replaced an awkward previous extension and conservatory. This design rationalises the space and provides a great connection with the garden. In this project the roof was raised to create a first floor level with a gallery landing. This design creates an interesting and unique ground floor entrance while linking the bedrooms above. A large opening with vertical emphasis was created to maximise views and natural light. This first floor extension above a former Smithy creates a fantastic bedroom with far reaching views over the surrounding countryside. The entire structure was raised and connected to the existing house in a sympathetic manner, creating two additional large bedrooms at first floor level and a large open plan kitchen/dining living room below. Stairs don't need to be boring! When space is a bit tight, it's amazing what you can achieve with a bit of consideration. In this informal meeting we will meet you in your home to discuss your ideas, explore the feasibility of the project and discuss any other ideas. After the meeting we will write to you outlining a design brief, the services we can offer as well as the fee to carry out the work required. It’s then up to you if you want to proceed! The starting point for any new project is to carry out a laser measured survey of the existing structures, This is a detailed survey picking up measurements and information such as existing drains, boundary locations etc. The survey is drawn up in "AutoCAD" which forms the starting point for the design work and acts as part of the statuary requirements for planning and building regulations permissions. Arguably the most important stage of the process as any decision made here could stay for generations. For this reason, we will carefully consider the various ways your brief can be met, and think laterally around the brief to make sure all options are considered. We are also keen to ensure you, the client, can visualise the solution before committing, for this reason we will often use 3D software to help gain a realistic understanding of the final solution. Initially several different design solutions will be explored and a meeting arranged with you where initial proposals will be presented to you. At this first design meeting, we will brainstorm these ideas and formulate a clear direction forward. Following this meeting, various amendments will be made until we reach a point where you will be 100% happy with the final design. We encourage our clients to be actively involved in this process. As a Bristol City Council accredited agent we are able to offer a fast tracked planning application process for householder planning applications. Planning permission is required for most of the larger extensions, however in the case of small single storey extensions, it can fall under permitted development. Either way we will act as your agent applying for planning consent or a lawful development certificate and carry out all negotiations with the planning department. Once the relevant planning consents have been obtained, building regulations approval will be required. We go above and beyond the statutory level of information required and will provide a detailed set of construction drawings which will include section drawings, large scale details, construction specification and lighting layouts. Once these details are agreed with you, we will submit the drawing package as a Full Plans Building Regulations Application and ensure these plans are passed before work begins. These drawings can then be used to obtain like for like tenders from contractors. Once on site, the building inspector will conduct site visits to ensure compliance with the drawings and building regulations. Robin Designs Ltd has years of experience providing Land Registry compliant lease plans to home owners, solicitors, landlords and chartered surveyors. These plans are used for a variety of purposes and are produced in accordance with Land Registry practice guide 40. "After 10 years working as an architectural technician/designer, I formed Robin Designs Ltd to provide a flexible way of working that allowed me to continue my passion for architecture and balance my family life. With experience in countless domestic projects, I recognised my skill as a creative designer, combined with my technical understanding of construction, enables me to provide my clients with a comprehensive design service. I followed an unconventional route into architecture. After gaining a 2:1 BA (Hons) in industrial design, I went on to work for IKEA providing a space planning service before becoming an interior designer for an office interiors company. I then went on to work for Lewis Foster Lewis Chartered Architects for10 years. During this time, I gained experience in most aspects of architecture, from creative design solutions right the way through to site inspections and contract administration. The skills I have gained over the years have been assesed and approved by the Chartered Institute of Architectural Technologist and I am now a full member of the institute (MCIAT) and Robin Designs Ltd is a registered practice. My approach to listening to my clients and understanding their requirements, together with creating interesting and imaginative architecture, has resulted in a growing reputation and client base. The fact that most of my enquiries are from recommendations, speaks for itself. " "We went to Robin for some ideas how we could transform our 1970's bungalow. We gave Robin a fairly open brief but with some specific requirements and a reasonably tight budget. Robin was able to incorporate our ideas into a fantastic design that we wouldn't have come up with ourselves. We were impressed that he took our budget into account and we couldn't be more pleased with the results." "Our experience of Robin’s approach to planning our extensive project has been exemplary. Robin was creative, flexible and patient when the project incorporated last-minute changes. 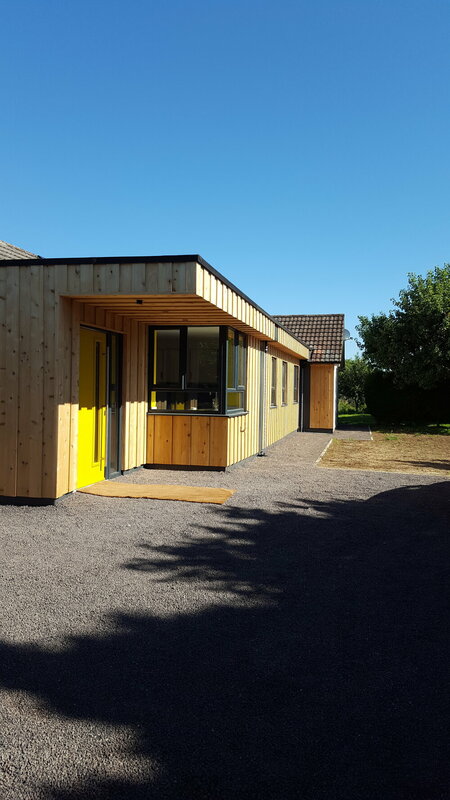 You can relax and let him take care of business: he was great at liaising with the local council, our structural engineer and our building contractor." "It’s been an absolute pleasure having Robin generate a design for us. We asked Robin to design a Granny annexe and associated alterations to our house. He listened to what we wanted and very quickly came back with a number of ideas for us to consider. The final design evolved through consultations and Robin pushed this through planning and building control without a single issue. Throughout the build Robin has always been available to provide immediate technical assistance and guidance. Now that the annexe and house alterations are complete we can see the extent to which his forward thinking has resulted in a super annexe which has been very skilfully blended into the existing house. I cannot more highly recommend Robin and would be delighted to show you the end result if you wish." "Both John and I would like to thank you for your time and effort on our behalf thus far and for your perseverance with the council-no mean feat!" "We appointed Robin as our architectural designer to help us design and apply for planning a side return extension for our end of terrace Victorian house. Robin was recommended to us from a friend and from the out set reaffirmed our choice of appointing him. 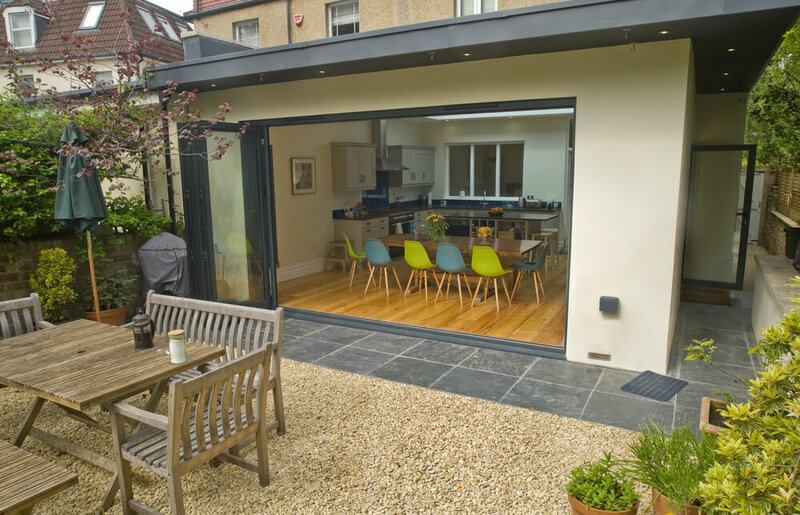 Robin's calm and considered approach allowed us to look at all the design options for our extension ensuring the design not only worked for us in terms of how we live today and in the future but also as a contemporary addition to what is an obvious period property." "From the start Robin was able to visualise a fantastic solution for our property making the most of the open views which we now enjoy every morning. Robin was able to combine the the natural environment with our growing family needs and we would not hesitate to recommend his services"
With our office in a central Bristol location, we are able to reach most parts of Bristol and the surrounding area with relative ease and are often able to offer an initial consultation at your home. We would love to hear about your project, so please provide as much information as possible by email or phone and we will be happy to chat this through with you.